Why Are U.S. Allies Killing Each Other In Syria? : Parallels The U.S. partners with both Turkey and the Syrian Kurdish group that the Turkish are attacking. Turkish army tanks head to Afrin, an enclave in northern Syria controlled by U.S.-allied Kurdish fighters, on Monday. It could be a bloody battle. On Tuesday, Turkey said it has killed at least 260 Syrian Kurdish fighters in four days in the Afrin region. The United Nations says the risk to the area's 324,000 civilians is high. Who are the Syrian Kurdish forces, and why is Turkey trying to kill them? The People's Protection Units, better known by the initials YPG. They make up the military arm of the Kurdish Democratic Union Party, or PYD. Multiple Kurdish groups have for years effectively controlled pockets of territory in northern Syria, with the tacit acceptance of the regime in Damascus. The why is a little more complicated. There are minority populations of ethnic Kurds in Syria, Turkey, Iraq and Iran. Many dream of living in an independent Kurdistan some day — a prospect that displeases the governments of all four states. A smaller number of militant Kurds, such as the Kurdistan Workers Party, the PKK, which operates out of southeast Turkey and northern Iraq, has taken up arms to achieve its goals. Turkey, the U.S. and the European Union have all designated the PKK as a terrorist group. Turkey also brands the Kurdish fighters in neighboring Syria as terrorists, citing their links to Kurdish militants on Turkey's side of the border. Both Kurdish groups hail the same leader, the jailed PKK chief Abdullah Ocalan, and PKK flags have been photographed at Kurdish political rallies in Syria. The U.S. and EU do not, however, label the Syrian Kurdish fighters as terrorists. Ankara argues the U.S. has no business arming and training a group that its ally Turkey considers a terror organization and an enemy. Turkey warns that U.S. weapons given to the YPG could be transferred across Syria's border to the PKK and end up being used against Turkish security forces. Thus far Ankara has not produced any evidence of this. Why does America support the YPG over Turkey's objections? At one level, it boils down to necessity. The U.S. military sees the YPG as seasoned fighters, well able to take territory from ISIS and hold it. The U.S. considers other Syrian rebel fighting units less reliable. Washington is sensitive to Turkey's concerns about the YPG but doesn't believe it can carry out the anti-ISIS fight nearly as well without the Syrian Kurdish fighters. What does Turkey hope to accomplish with this operation? Turkish officials say they're aiming to create a 19-mile-deep "safety zone" inside Syria, with no Kurdish fighters in that area stretching from the Turkish border. 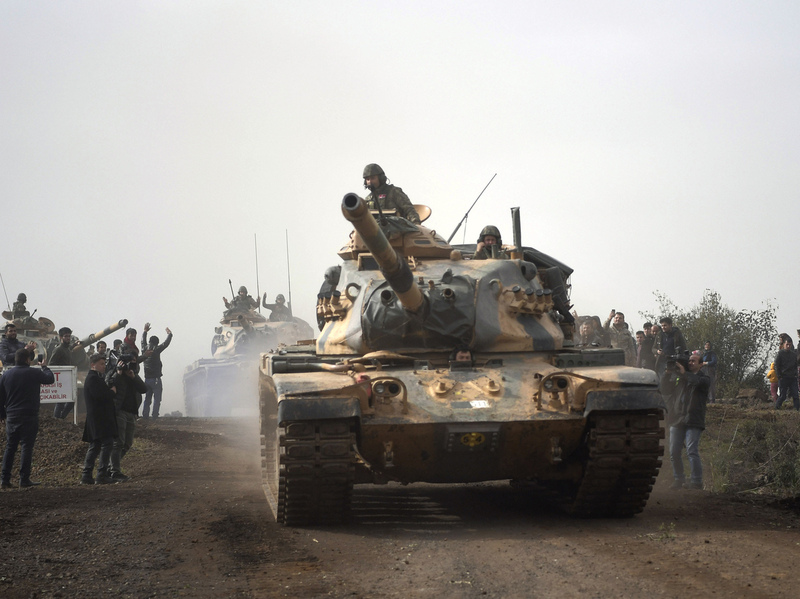 Beyond that, Ankara says it's seeking to prevent Syria's Kurds from joining up their pockets of control into a single, contiguous area of Kurdish authority. Ultimately, President Recep Tayyip Erdogan says, Turkey aims to stabilize northern Syria to the extent that millions of Syrian refugees who have lived for years in Turkey can go home. How is the world responding? A number of countries in Europe, the Middle East and elsewhere have called for a swift end to the Turkish incursion, worrying about its potential for further destabilizing an already volatile situation in Syria. The White House urged Turkey to "exercise restraint" in the operation. Russia, however, is choosing to blame the U.S. for what it calls "unilateral actions" in Syria that infuriated Turkey. Moscow is Syrian President Bashar al-Assad's most powerful ally. A number of analysts say Russia has been engaged for some time in trying to draw Turkey out of the U.S. orbit of influence. Officially, Washington says its alliance with Ankara remains strong and necessary, and it's working with Turkey to address legitimate security concerns and return the focus to defeating ISIS. In some conservative U.S. circles, however, questions are growing about Turkey's commitment to NATO and the West. The U.S. relies on Turkey in a number of areas. One of the most prominent is the use of Turkish air bases for launching U.S. and coalition airstrikes against ISIS. The EU also depends on Turkey to stem the flow of refugees and migrants attempting to reach Europe. But with the battle against ISIS apparently winding down in Syria, the YPG finds itself with waning political capital in Washington and facing a Turkish government that's determined to keep Kurdish influence in northern Syria fragmented and nonthreatening.